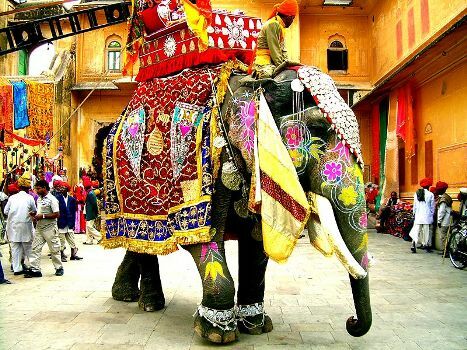 The Elephant Festival is an annual festival which is held every year in the Pink City, Jaipur. This matchless event is organised on the full moon day of Phalgun Purnima which falls in the month of February/March. It is celebrated on the day before the festivals of colours i.e. Holi. From the ancient times, elephants have always been an important part of the Indian society. The Elephant-headed God, Ganesha, believed to be the remover of obstacles and foremost to all the gods, is revered and devotedly worshipped in all the parts of India. They are also one of the most important parts of religious events, marriage ceremonies, processions, etc. and in the historic time, they were a significant part of the battlefield. For this festival, elephants are nicely groomed and clothed with colourful and embroidered velvets rugs and parasols and other heavy ornaments like huge elephant jewellery and anklets decked with bells. Intricate traditional Indian motifs are then painted on their bodies. Ear danglers and coloured brocade scarves adorn their ears and necks respectively. Their tusks too get jewelled up by adorning them with GOLD AND SILVER bracelets and rings; while foreheads are beautified with royal looking head-plates. All this is done by their Mahouts (keepers/riders) after they are done giving their elephants a bath. Moreover, the Mahouts too bask into the sunshine of the festivities by perking up themselves in brocade jackets and royal turbans. This festival begins with the huge and enthralling procession of the royal elephants painted with different shades of colours, embellished with heavy silver ornaments, and embroidered clothes. The elephants enter the ground with their mahouts, thumping to the sound of nagadas and loud blows of bankiya, a musical instrument. The participant elephants are all females. Elephant polo, Elephant race, the tug-of-war between Elephant and 19 men and women are the special features of this grand festival. There are live performances of dancers and musicians too. In addition to this, in the procession there are chariots, lancers on horses, camels, and palanquins. This festival is enjoyed by a huge number of crowds including the visitors from different parts of India as well as abroad. This festival, organised by Rajasthan Tourism and has now become an important part of its' annual events calendar. In previous time, this festival was held at the Chaugan Stadium located in the old city area of Jaipur but due to the increase in crowds and fame, its venue got changed in 2011 and has been shifted to Jaipur Polo Ground which is opposite to the Sawai Mansingh Stadium.